A business card slitter is exactly what it sounds like; a machine that cuts large sheets of paper into business card size sheets. A standard business card is 2 ½" x 3" and can be printed either portrait or landscape style (landscape is the more traditional route). No matter the design, the card size remains the same. This ensures it fits properly into business card pockets and wallets. The word "slitter" refers to the style of cut that is used to produce the cards; it indicates a rotary or slicing cut, rather than a guillotine (straight up and down) cut. But there are actually some newer machines that actually combine both kinds of blades for a faster one-step business card cutting solution. 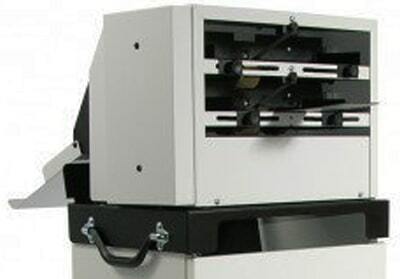 Business card slitter machines can vary quite a bit in their functionality, speed, features, and price. They are available in small desktop manual cutters under $100 where you crank a handle to activate the cut, all the way up to nearly automatic cutting machines that can cut 300 cards or more per minute that cost closer to $4,000+. The CardMate business card cutter offers the perfect solution for small home businesses and small offices that want to be able to make their own business cards, on demand. This economical business card slitter is so low-cost, that it will pay for itself after just the first couple of uses. To use this simple business card slitter, just place a single sheet of pre-printed 8 ½" x 11" paper (choose a 10-up, no bleed, business card template in your preferred software) into the rear slot of the machine, use the self-centering guides to ensure it is straight, and turn the crank on the right side of the unit. You now have two, 3 ½" x 11" sheets with 5 business card designs on each. One at a time, take these sheets and place them into the front slot of the unit, centering the guides and turning the crank again. Now you have ten perfectly finished standard 2 ½" x 3" size business cards. The CardMate works well with standard papers, including bond, cover, index and card stock styles up to 110# thick. 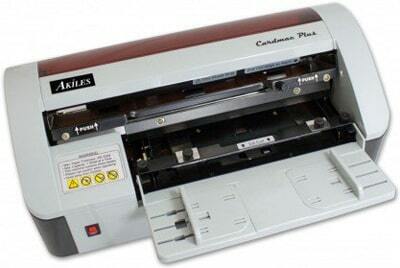 In general, if the sheet can run through a desktop printer, it will run through the CardMate. 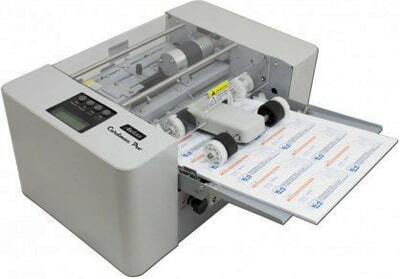 The Akiles CardMac Plus business card slitter features a gutter cut and can create full-bleed business cards with a full bleed, which means that the ink can go all the way to the edge of your card, without worrying about the ink from one card appearing on the card next to it. A 10-up cut format, the CardMac Plus will cut a total of ten standard 2" x 3 ½" cards per sheet of paper, and can cut at speeds up to 30 cards per minute. 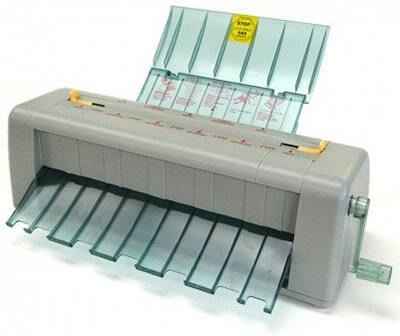 This desktop business card cutter is simple to operate and requires two passes through the machine to create your cards. First, print out your sheet onto letter size paper up to 350 GSM thick using the appropriate template. Center your page in tray 1 and feed it through. Once your sheet exits, place one of the two strips of cards into the second tray and make sure the red arrow is lined up between the 3rd and 4th cards. Press the sheet flush against both back stops, and aligned to the right of the tray, then push the tray in to make the final cut. Repeat this step for the second strip of cards, and you're done. The Akiles CardMac Plus is an affordable solution for professionally cut business cards, and fits comfortably on any desktop for use in an office or at home. The CardMac Pro has been manufactured by Akiles as a durable electric cutting machine that is more versatile than and other, allowing the user to create not only traditional business cards measuring 2" x 3 ½", but a selection of other pre-set card sizes including 1.77" x 3 ½", 5" x 3 ½", and more, as well as customizable sizes from as small as 1.18" x 3 ½" to as large as 9.84" x 3 ½" (the 3 ½" dimension is fixed). In addition to the versatility of card size, the CardMac Pro offers speed and convenience like no other in it's price point with single-pass cutting, meaning you only have to insert your sheets only once to produce perfect business cards. Easy to set up and use, the CardMac Pro business card cutter is in a class of its own. 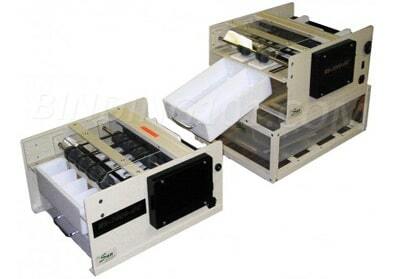 This electric business card slitter also offers a gutter cut that works perfectly for full-bleed business cards, so you are not limited to any particular card design. When you buy the Akiles CardMac Pro electric business card slitter online, you can produce professional-quality cards of many sizes from the comfort of your office, saving your business money and time.